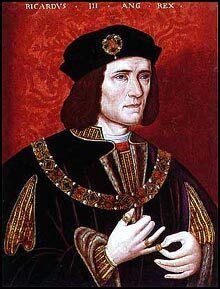 I am besotted with the search for the bones of Richard III. Archeologists, working from a scrap of map dug up in a dusty file, may have pinpointed the site of the Grey Friars chapel that vanished after Henry VIII’s dissolution of the monasteries. Spurred by author Philippa Langley, a team in Leicester, England, is excavating underneath a government parking lot in search of the remains of the last Plantagenet king, who died in battle at Bosworth just a bit over 500 years ago. I read the news almost hourly and have done since the team cracked open the pavement a week ago. My Google alerts galvanize me as I read of the chunching up of tarmac, cutting open of layered topfill, endless transit measurements and map-checking, trenching. The last English king to die in battle, famously for want of a horse, Richard III was given rough treatment by Shakespeare, himself a beneficiary of the Tudors, who unseated Richard at Bosworth Field and reportedly disposed of his body in a nearby monastery. The plays paint him as a hunchbacked schemer who stole the crown by murdering two princes who were ahead in the line of succession and, to their disadvantage, put in his care in the Tower of London. As of this morning, the bones have achieved celebrity status here on Planet History Geek. Male, scoliosis that would make the fellow appear to have had a hunchback, a sword cut chop to the back of the skull, and an arrow in the vertebra – it has to be him! Dancing to the tune of cold case detectives everywhere, the bones are en route to a DNA lab, to be checked against the cheek smear of a direct descendant of Richard III’s sister. Is this thrilling or what! Will it end there? A few hard questions remain, regardless of DNA. If the bones are Richard’s, does protocol call for reburial in a more appropriate place for a king, such as Westminster Abbey or even the Leicester churchyard? Richard is not the only English king to disappear; King Stephen and Queen Maude were dumped in a ditch outside Faversham Abbey and haven’t been seen since. It is unsettling that I know that sort of thing, but there it is. And if the bones are not Richard’s, do they go back under the parking lot, with a kindly note from diggers to apologize for the inconvenience to those civil servants who for the last two months had to find a meter at the curb? And if these detectives can prove it was Richard III, what about the bones of two youngish people unearthed a few years ago in the Tower? Can they prove those children were the princes, and that they were murdered? Not least, is anyone out there looking for the horse? See what a writer doing historical research can do? I’m speaking on that very topic in Dayton, Ohio, on September 29-30, and now I have something to talk about.